Healing You, Healing Your Animal and Vi Miere offer powerfully facilitated healing sessions. Each session is tailored to you and your animal to meet you and your animal where you currently are. With a wide range of healing tools, Vi Miere is able to help with a broad range of issues for clearing and balancing. 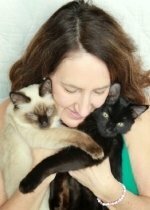 Click here to schedule your complimentary meeting with Vicki to find out how to bring you and your animal closer to optimum health with better quality of life. Manipulation of skin, muscle and joints to relax muscle spasms, relieve tension, improve circulation and hasten elimination of wastes. It also stretches connective tissue and improves circulation. A wonderful antidote to stress and muscle tension. Massage does not rub away weight, but will rub away fatigue, inducing relaxation. Acupressure has been used for centuries promoting optimum health and general well-being. It aids the body in balancing itself and promoting it's own natural curative abilities. Acupressure uses the same pressure points as acupuncture with the gentle touch of fingers. A light-touch therapy improving the central nervous system, allowing the body to better relieve stress and strengthen resistance to disease. It pinpoints and corrects problems at their source for lasting benefits. Reiki is a form of healing that is becoming increasingly popular worldwide. Reiki involves the transfer of energy through the practitioner to client to enhance the body's natural ability to heal itself through the balancing of energy. It is a holistic, natural, hands-on energy healing system that touches on all levels: body, mind, and spirit. Worldwide Healing Sessions are available for those who are open to exploring the benefits of energy work available where you are located. Energy does not know time or space; therefore, energy can be balanced in a person or animal without using touch, without being in the same room or without even being in the same state or continent. This option opens the healing session to you wherever you are located using phone or internet to connect for personal interaction. As a natural born animal communicator, you receive a translator between you and your animal to get you on the same wavelength of communication and understanding each other. Find out what your animal wants you to know to help him/her live happy, healthy, harmonious life. Consulting is available in 15 and 30 minute increments for people/students wanting advice from someone who has been in the field awhile.